Love this Astrid. Beautifully put. Thanks, Anna. I feel like this sewing journey teaches me so much that I need to know about the rest of life -- and I love that! Thanks, Kaylan. It seems this world constantly has more things we "need" -- and it's such a relief to release myself from that whenever possible! Oh this is perfect!! Yes to all you have said! I don't want to be sponsored etc because I would always feel obligated. I love lots of 'trendy' fabrics but I don't HAVE to have the lastest. I love mixing lines of fabric together and go by colour more than anything. Such a great post which is so eloquently put! Thanks for your kind words, Collette. I love trendy fabrics, too -- and having only been sewing for a few years, most of them are new! But I work hard to create designs that are my own, rather than a Lotta-Jansdotter-quilt, or an Amy-Bulter-quilt. There are of course lovely things about being sponsored -- freebies! -- but when that comes at the expense of your own voice, it troubles me. What a beautiful quilt top, I think it "goes" absolutely! Love this kind of scappy, improv piecing. Love this! Glad I can keep up with your blog during my break from instagram! I love this quilt, and this post. I spend a lot of time thinking about the fabric I buy, versus the fabric I use. And the quilts I pin, versus the quilts I make. 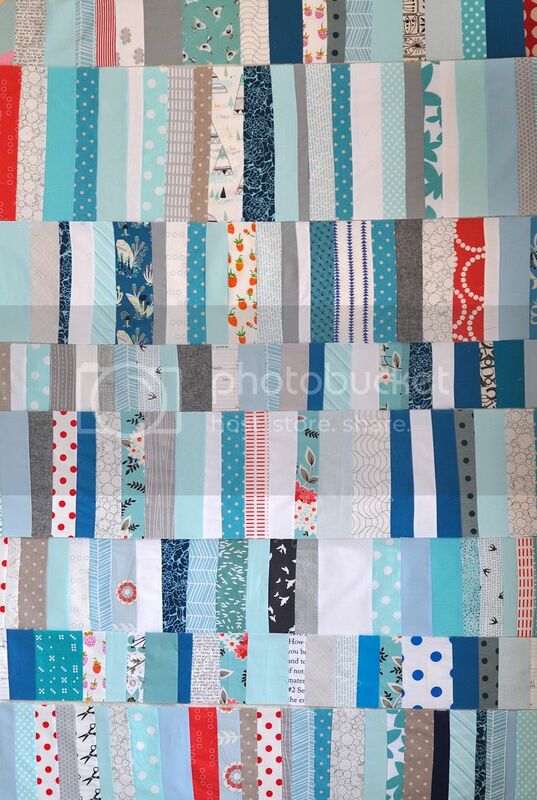 I pin all these quilts that are made from solids and then buy tons of prints. Some of it for me has to do with wanting to stay safe in my making so I'm not wasting time, but I think I'll be more creatively fulfilled if I risk wasting fabric in order to make something I'll feel prouder of in the end. Can you hear me applauding your words? Thanks for putting in print what has been screaming in my head for a long time. I like to put together my own fabrics and don't like it when I get asked "oh, what fabric line did you use?". 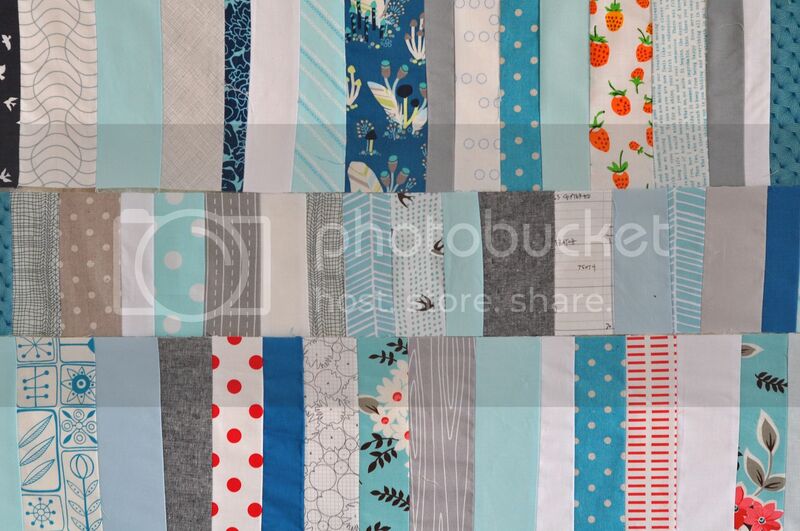 Precuts of entire fabric lines are lovely and useful and I'm glad we have them as an option. I sometimes use them in my quilts, but part of what makes quilting creative for me is to make my own fabric combinations. Creativity is essentially a very personal element of art. Like you, I love mixing it up, not a static formula. I do not think I have ever done a pattern as written. I see the new fabrics & patterns as a tool, a springboard, not the destination. Thank you for your thought provoking words. Just so perfectly said. Every line. Thanks for this. I hope many people read it. I just found your site through looking for examples for the PMQG and I just have to say thank you for this post and the work you are doing. I am super inspired by your quilts and especially your palette. Just lovely all around, looking forward to seeing more! Yes, you are right, right, right! So many blogs are all about selling. And I understand that if I want to be inspired and to see what others are doing, I have to accept that people need to have an income. Features on "stash management" which normalise fabric addiction can be so depressing. I love fabric as much as anyone. 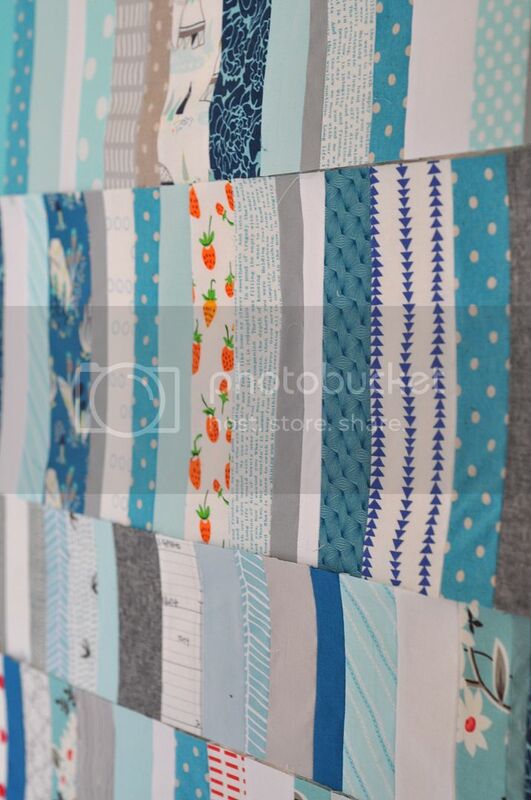 But is is great to see your lovely quilt made from scraps. It is beautiful. I love the "scrappy" look whether it was intentional or not. I am not crafty but I know that I like the way it makes me feel. In so many ways my life is like that... Scraps but when I look at it as a whole, it works. Love your work, writing, and general outlook on things! I just discovered your blog and this post resonated with something I have been trying to figure out with my own sewing and crafting. Thank you for writing it! I totally agree with what you've written. I've actually read it a few times as I check back in to see what you're up to. I'm quite new to quilting - less than a year - but I've clocked up a LOT of time reading quilt blogs while feeding (didn't have an iPad with my first two but it is my wonderful/evil distracting companion with my third). Anyway, I've found my favourite blogs are like yours - no commercial clutter! I live in Australia where our dreadful right-wing government is attacking, well, pretty much every good public institution there is - public health, schools, universities, research bodies and of course public broadcasting. Their obsession with the economy over everything else is sickening. So I am particularly fond of people who put in such time and effort on blogs without commercial obligations. Your quilts are just wonderful, by the way. I really like what you do and look forward to reading more of your thoughts. Found you via Instagram and couldn't agree more!! Just discovered your blog (I'm working on my first quilt - made from my late grandma's fabric stash, as a surprise for my mom). This post is just lovely. Can't wait to explore your other posts and to see more of your beautiful creations. Thank you for being so genuine and honest - it's such a breath of fresh air. I'm new to quilting and your blog but you've nailed the crux of so many crafting bloggers. If you take the free goodies which is so appealing, it comes at a price of being exclusive. I've always found that limits my creativity and isn't honest in how I create. I'm looking forward to reading more of your blog and seeing your beautiful quilts. THANK YOU!! I Just discovered your blog- love your work and your words.